Marsden Hartley was born today, January 4, in 1877. He was an American Modernist painter, poet, and essayist. Hartley was born in Lewiston, Maine, where his English parents had settled. He was the youngest of nine children. His mother died when he was eight, and his father remarried four years later to Martha Marsden. His birth name was Edmund Hartley; he later assumed Marsden as his first name when he was in his early 20s. A few years after his mother's death when Hartley was 14, his family moved to Ohio, leaving him behind in Maine to work in a shoe factory for a year. These bleak occurrences led Hartley to recall his New England childhood as a time of painful loneliness, so much so that in a letter to Alfred Stieglitz, he once described the New England accent as "a sad recollection [that] rushed into my very flesh like sharpened knives." After he joined his family in Cleveland, Ohio, in 1892, Hartley began his art training at the Cleveland School of Art, where he held a scholarship. 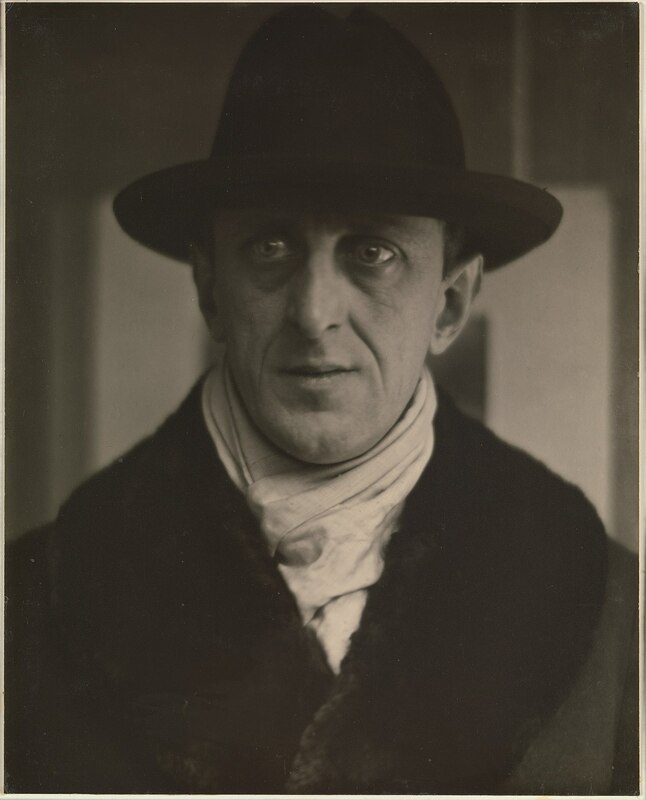 Hartley first traveled to Europe in April 1912, and he became acquainted with Gertrude Stein's circle of avante-garde writers and artists in Paris. Stein encouraged Hartley to write as well as paint. In 1913, Hartley moved to Berlin, where he continued to paint. He also collected Bavarian folk art. His work during this period was a combination of abstraction and German Expressionism, fueled by his personal brand of mysticism. Many of Hartley's Berlin paintings were further inspired by the German military pageantry then on display, though his view of this subject changed after the outbreak of World War I, once war was no longer "a romantic but a real reality." 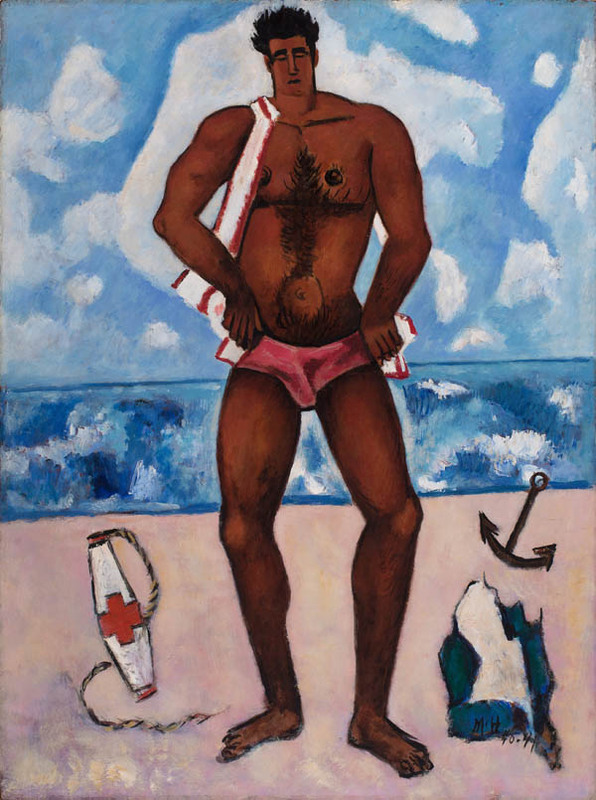 The earliest of his Berlin paintings were shown in the landmark 1913 Armory Show in New York. In Berlin, Hartley developed a close relationship with a Prussian lieutenant, Karl von Freyburg, who was the cousin of Hartley's friend Arnold Ronnebeck. References to Freyburg were a recurring motif in Hartley's work, most notably in Portrait of a German Officer (1914). Freyburg's subsequent death during the war hit Hartley hard, and he afterward idealized their relationship. Many scholars interpreted his work regarding Freyburg as embodying his homosexual feelings for him. Hartley finally returned to the U.S. in early 1916. 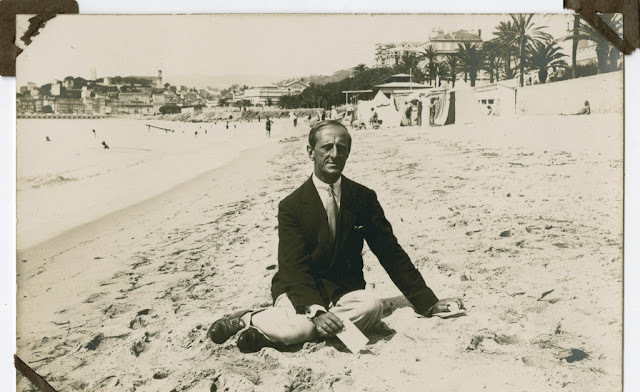 He lived in Europe again from 1921 to 1930, when he moved back to the U.S. for good. He painted throughout the country, in Massachusetts, New Mexico, California, and New York. He returned to Maine in 1937, after declaring that he wanted to become "the painter of Maine" and depict American life at a local level. 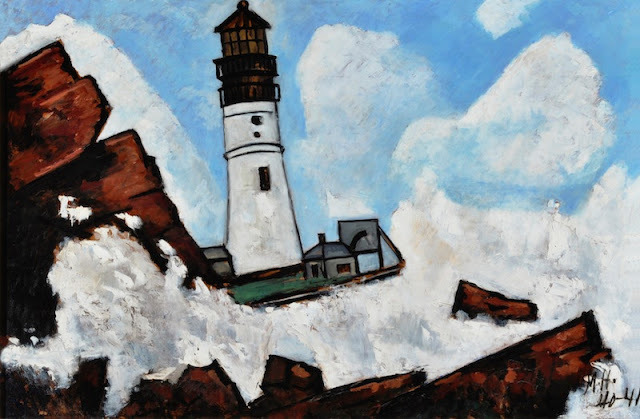 This aligned Hartley with the Regionalism movement, a group of artists active from the early- to mid-20th century that attempted to represent a distinctly "American art." He continued to paint in Maine, primarily scenes around Lovell and the Corea coast, until his death in Ellsworth in 1943. His ashes were scattered on the Androscoggin River.In addition to being considered one of the foremost American painters of the first half of the 20th century, Hartley also wrote poems, essays, and stories. His book Twenty-five Poems was published in Paris in 1923. Cleophas and His Own: A North Atlantic Tragedy is a story based on two periods he spent in 1935 and 1936 with the Mason family in the Lunenburg County, Nova Scotia, fishing community of East Point Island. Hartley, then in his late 50s, found there both an innocent, unrestrained love and the sense of family he had been seeking since his unhappy childhood in Maine. The impact of this experience lasted until his death in 1943 and helped widen the scope of his mature works, which included numerous portrayals of the Masons. He wrote of the Masons, "Five magnificent chapters out of an amazing, human book, these beautiful human beings, loving, tender, strong, courageous, dutiful, kind, so like the salt of the sea, the grit of the earth, the sheer face of the cliff." In Cleophas and His Own, written in Nova Scotia in the fall of 1936 and re-printed in Marsden Hartley and Nova Scotia, Hartley expresses his immense grief at the tragic drowning of the Mason sons. The independent filmmaker Michael Maglaras has created a feature film Cleophas and His Own, released in 2005, which uses a personal testament by Hartley as its screenplay. 1940 – 41. Oil on Masonite-type hardboard.